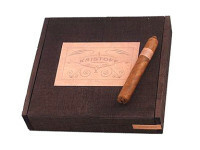 We’re proud to offer an old classic this week from Glen Case‘s Kristoff Cigars: The Kristoff Criollo, a sturdy blend of select Cuban-seed Nicaraguan and Dominican fillers and a Dominican olor binder, perfectly finished with a wrapper of rich, oily Honduran habano criollo. The overall flavor can best be described as savory, an earthy, cedar-like base with notes of spice and nut…a smoke you can practically chew. Get yourself a fistful of these babies, because a cigar this good is very hard to find at this week’s price!